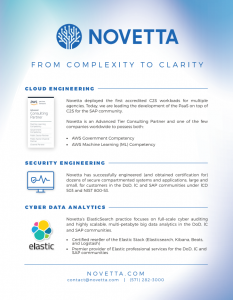 Novetta deployed the first accredited C2S workloads for multiple agencies; today, we are leading the development of the PaaS on top of C2S for the SAP community. Novetta has successfully engineered (and obtained certification for) dozens of secure compartmented systems and applications, large and small, for customers in the DoD, IC and SAP communities under ICD 503 and NIST 800-53. Our ElasticSearch practice focuses on full-scale cyber auditing and highly scalable, multi-petabyte big data analytics in the DoD, IC and SAP communities. Click photo to download. Novetta Cyber Analytics is an advanced network traffic capture, inspection and analytics application for medium to large enterprises and government agencies. 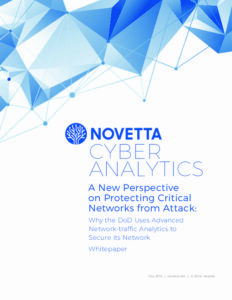 Designed to ensure rapid detection of breaches, significantly reduce attacker dwell times, and enable immediate remediation to reduce further exposure, Novetta Cyber Analytics delivers the fastest and most precise network traffic analytics possible. 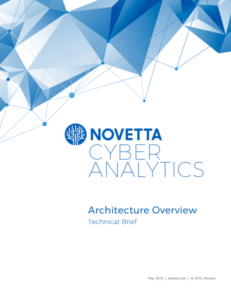 Download this white paper for an overview of the technical architecture of Novetta Cyber Analytics. Security Information and Event Management solutions – SIEMs – have become quite commonplace within cyber security operations today, and because of this, there is a lot of confusion as to exactly what a SIEM is versus an advanced network-traffic analytics solution. The short answer is that SIEMs aggregate, correlate and analyze events, logs and alerts produced by machines, while an advanced network traffic analytics solution enables the rapid analysis of raw network-traffic by security analysts. The longer answer is, of course, much more complex than this, while cyber security shops that use both have a powerful combination on their hands…. The U.S. DoD was constantly getting breached – none of the tools they had built or purchased were working to prevent this (including SIEMs and Security Analytics packages). Learn how they solved this problem using an advanced, network-traffic analytics solution. Your guide to Novetta Customer Support. 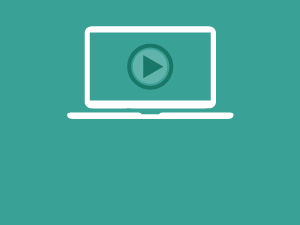 A guide to help you maximize your technology investment; an outline of product assistance tools and an introduction of available services. Novetta Cyber Analytics enables analysts to think and react as fast as their attackers – immeasurably improving the security posture of any enterprise or organization. Learn more about the top 10 built-in investigative analytic searches showcasing how the solution is used and why it’s so powerful. When a large government agency was hit with multiple attacks, they needed answers. Even though they were actively using leading network forensics and packet capture (PCAP) tools, they were unable to execute queries and analysis quickly enough to uncover what had occurred. Like many organizations, an agency had been victimized by multiple cyber attacks. With their globally dispersed network of hundreds of entry and exit points along multiple 40Gbps network channels, gaining complete situational awareness of all network traffic was impossible. They knew something more must be done. Novetta Cyber Analytics was able to overcome the agency’s challenges by creating an Advanced Analytics solution purpose-built to address the specific needs of network security. Given the current state of cyber security, what can enterprises do to protect themselves from data theft and other malicious activities? This white paper provides critical information about how an organization can significantly reduce damages caused by sophisticated attackers using advanced network-based analytics.